Montage showing the 4 great moons of Jupiter: Io, Europa, Ganymede and Callisto. 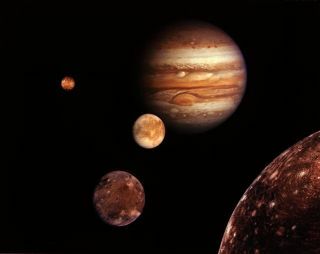 Life on Earth or Mars could have been brought to the moons of Jupiter or Saturn on rocks blasted off those planets, researchers say. These findings suggest if scientists ever detect life on those moons, they might have to contemplate the possibility that it came from elsewhere rather than originating there on its own. Martian meteorite ALH84001. The meteorite is sliced to show its interior. Found in the Allan Hills ice field in Antarctica in 1984, the four-billion-year-old rock is one of the oldest in the world. The meteorite likely originated just below the surface of Mars. About 16 million years ago, another meteorite struck the area, blasting it off into space before it landed on Earth about 13,000 years ago. Although lithopanspermia might seem farfetched, a number of meteorite discoveries suggest it might at least be possible. For instance, more than 100 meteorites originating from Mars have been discovered on Earth, blasted off the red planet by meteor strikes and eventually crashing here. Some researchers have even suggested that life on Earth may have originally been seeded by meteors from Mars. A great deal of research has explored whether the red planet once harbored lifeand whether life might still exist there today, based on findings that Mars might once have been significantly more hospitable to life than it is now, and that refuges for life could remain hidden under its surface. One Martian meteorite, Allan Hills 84001 (ALH84001), was even initially claimed to contain evidence of life. However, research since has revealed that every item on this meteorite that was potentially suggestive of life could be generated inorganically. Past computer simulations also have suggested that matter blasted off Earth by cosmic impacts could have escaped the pull of Earth's gravity and landed on the Moon. Billions of years of Earth dust may have accumulated on the lunar surface — as much as 22 tons (20 metric tons) of Earth material is spread over every 38 square miles (100 sq. km) of the Moon. If true, the Moon could hold fossils of some of the earliest microbial life on Earth. The discovery of organisms on Earth that can survive in environments once thought too harsh for life has piqued interest over whether the moons in the outer reaches of the solar system, such as Jupiter's moon Europa or Saturn's moon Titan, could host life. Worth and her colleagues analyzed where batches of several thousand rocks traveled once ejected off both Earth and Mars. "We ended up simulating over 100,000 individual fragments," Worth said. Most of these meteoroids slammed back into their home planet. A great many rocks also were either swallowed by the Sun or left the solar system entirely. In addition, large numbers hit planets more inward in the solar system from their home planet — for Earth, that means Venus and Mercury, and for Mars, that means Earth, Venus and Mercury. However, a small fraction of meteoroids did hit planets outward from their origin. Series of images taken by the Huygens probe as it descended to the surface of Saturn’s smoggy moon, Titan. The researchers calculated that over the course of 3.5 billion years — roughly the amount of time Earth is known to have possessed life — about 200 million meteoroids large enough to potentially shield life from the rigors of space were blasted off Earth. They also estimated roughly 800 million such rocks were ejected off Mars during the same period. More rocks escape from Mars because Martian gravity is a little more than a third that of Earth's. Past research suggested moderately-sized rocks ejected from impacts could protect organisms from the dangers of outer space for up to 10 million years. The scientist calculated about 83,000 meteoroids from Earth and 320,000 from Mars could have struck Jupiter after traveling 10 million years or less. Also, roughly 14,000 from Earth should have hit Saturn in that time, and no more than 20,000 from Mars. Since the moons of those giant worlds are relatively close to their planets, many of them might get peppered by these meteoroids as well. The researchers calculated that Saturn's moons Titan and Enceladus and Jupiter's moons Io, Europa, Ganymede and Callisto should each have received between one and 10 impacts both from Earth and from Mars. These findings suggest the possibility of transfer of life from the inner solar system to the outer moons, although very rare, currently cannot be ruled out. "When planning missions to search for life on Europa or other moons, scientists will have to think about whether they can distinguish between life that is or is not related to that on Earth," Worth said. The researchers caution they are not saying "that life has made it to any of these moons, just that it could," Worth said. "To know for certain that this kind of transfer has happened, we would need to actually identify an Earth or Mars rock on one of the moons in question. We tried to make our estimates as realistic as we could, but they are still estimates, and we can never know for sure what will be discovered in the future that might change our assumptions." Still, the researchers note the icy moons of Jupiter and Saturn were all once warmer and likely had little to no icy shell to prevent meteorites from reaching their liquid interiors as they do now. In addition, Europa currently has the thinnest ice crust of the six moons the researchers examined, and roughly 40 percent of its crust appears to be covered with "chaos regions," uneven terrain hinting that it often breaks into large chunks separated by liquid water that later refreezes. Any meteorites on top of such regions therefore might have a chance of falling down into the underground oceans that moon is suspected to have. "I think the possibility of any life in Europa's oceans is exciting, whether it is descended from Earth life — showing us a novel evolutionary path in a very interesting environment — or life that comes from an independent origin, which would point towards life being fairly common in the universe." Worth noted one factor not included in their simulations that could be significant was the Yarkovsky effect, where rotating objects about 4 inches (10 centimeters) to 6 miles (10 kilometers) large will radiate heat that can help propel them through space. "We expect that this effect would basically spread the ejected rocks out faster, as some would be propelled outward and others inward, so we might see slightly faster transfer times," Worth said. The scientists added that rocks crashing back onto their home planet could help reseed life on that world after the cosmic impact that created them partially or completely sterilized the planet in question, serving as refuges for life in space while the world's surface cooled enough to permit survival. This could help explain how life on Earth survived the era known as the Late Heavy Bombardment about 4.1 billion to 3.8 billion years ago, when untold numbers of asteroids and comets pummeled Earth, the Moon and the inner planets. Worth and her colleagues Steinn Sigurdsson and Christopher House detailed their findings online Dec. 6 in the journal Astrobiology.